I can't believe I'm finally down to our last few hours in Japan (not my final blog post though, I will have just one more for summary + personal budget). The rush isn't because I have a deadline, I just want to lay everything down before I go on and move on with my life (haha!). But on our last day, we were already exhausted. I haven't had any long sleep, and had developed blisters from all the walks (that's why I wore slippers nalang in Yokohama, hahaha). 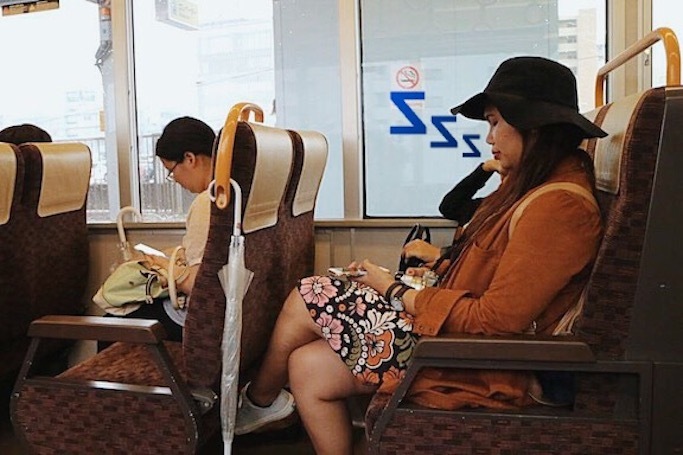 Spotted several Japanese sleeping in trains, dead tired from work. But walang tatalo dito! Parang naka posing lang, but he is either drunk from last night, or just showing us how it's done in Japan, haha! Ang pinaka gusto ko is dinadaan-daanan lang sya, walang pakialamanan! But even though physically and mentally I am as tired na as Kuya above, I still woke up early to take advantage of our itinerary-less last few hours in Japan. I've find myself doing this during my past travels, sagarin na before heading home. So I set my alarm at around 6am. Sarah joined me as we dragged our calloused feet out of our Airbnb. Huling pagpupugay kay Hachi! Hehe, realized that I still had no photos with Hachiko for this trip, and asked Sarah if we can pass by for final snaps. Picturean na in all angles! Hahaha adik. Sarah and I also looked for the airport transportation my Ate recommended so we don't have to take the train again with our heavy maletas: The Limousine Bus. I remembered taking this shuttle last year, but we bought our tickets from a hotel in a different district. I asked Ate about this hotel, but she told me that the bus also goes to Shibuya through Shibuya Excel Hotel Tokyu - conveniently just behind Hachiko! Sarah and I just walked and asked around till we saw the hotel with their ticket booth at the lobby area. Here are the schedules for the airport limousine. We gave our flight details so they can help us with the best time slot to take. I was looking through the places we skipped in my Tokyo itinerary, and decided to check out Daikanyama. It's just a station away from Shibuya, so Sarah and I thought it's the perfect place to explore and have breakfast without going too far. Daikanyama is a quiet counterpart to Shibuya's all-day frenzy. Kiko said it is like "Beverly Hills", hehe. I can also compare it to Seoul's Gangnam where you can find the hippest hangouts, art spaces, cafes, and high-priced boutiques. They are mostly local brands. Thank you Sarah for joining me in making the most out of this trip! When I asked her, "Nasayang ba ang gising natin?" pertaining to the mostly closed establishments, Sarah said that everything's worth seeing. "At least may idea ka na diba, tapos balik nalang next time." We can't decide on where to dine in the few operating cafes in Daikanyama, so we decided to just head back to Shibuya. We've used up our Tokyo Metro 3-day pass till the end, so it was time to just waste our few hours in our neighborhood. I miss this crossing! We entered a random mall, where we saw Hachiko stuffed toys and photos everywhere. And this time, I am satisfied to finally have it in Ichiran's trademark solo cubicles! Final shopping in the area! Walked inside several stores, including this thrift shop near our Airbnb. This was where I was able to buy my Vintage Celine sling bag. After the purchase, handa na talaga ako umuwi, hehe! An odd looking French themed coffee place just across our street, but didn't bother to try the past days. Sarah and I decided to stay here while waiting for Pax. When time is almost up, all three of us pulled our bags to Shibuya Excel Hotel Tokyu for our airport limousine schedule. They didn't fill up the bus, so our seat space is very comfortable. Super convenient, good service, and highly recommended! Nice blog! Been hoping to visit Japan too huhu it's too beautiful! Awesome shots too! What cam are you using?